The Mayor’s Council on Pipeline Safety brought together elected leaders and policymakers from all around the country to discuss how to prevent gas explosions and cut methane emissions. The first annual conference of the Mayor’s Council on Pipeline Safety featured UWUA Senior National Representative Bernie LaBelle and Regulatory Affairs Director Carl Wood. Held May 14-15 in Philadelphia, the conference brought together elected leaders and policymakers from all around the country to discuss how to prevent gas explosions and cut methane emissions. The Mayors from San Bruno, CA, and Allentown, PA participated, saying they were striving to prevent another natural gas explosion like the ones they have had. 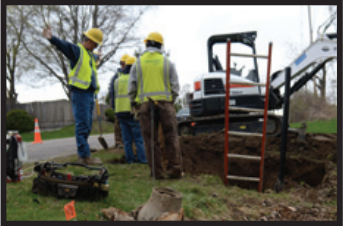 They have committed to work with all Federal, State, and Local agencies and officials as well as utilities. The conference was also attended by first responders from San Bruno and Allentown. LaBelle and Wood participated on panels addressing the need to create national standards for investigating and classifying gas leaks, and shared best practices on leak detection and repair. The UWUA is in the forefront of a national effort to protect gas workers and communities from disasters, and the environment from methane leaks. Entitled, “Lest History Repeat Itself – Pipeline Safety Initiatives,” the need to replace the aging cast iron gas mains across the country was a premiere issue at the conference. Some gas lines were installed when Abe Lincoln was president and are still active today, 150 years later. The National Transportation Safety Board (NTSB), the Pipeline and Hazardous Materials Safety Administration (PHMSA), and utility regulators from various states gave presentations on current programs underway, but also the need for more action and funds to improve public safety. Everyone agreed that more teeth are needed to mandate that utilities make it a priority to replace the aging pipelines versus shareholder dividends and capital investment. The BlueGreen Alliance and the Sierra Club also participated in the conference.